I was not a writer to begin with; I was a listener. In those early decades of the century, reading and writing were not common experiences. Oral storytelling was the basis of fiction. It seems obvious that the pleasure of writing (like the pleasure of any form of artistic creation) consists of an incessant joy in weaving plots (as was asserted by Sigmund Freud, the father of psychoanalysis), engaging in the act (so beloved of E. Caldwell) of “storytelling,” the act of narration, that not only allows memories and sometimes obsessions or fears to be concretized, but also makes liberation from them possible. Perhaps precisely in this skillful weaving of plots, rendering readers’ experience of them comparable to reading nonfiction or documentary texts, lies the seductive power of the prose of Erskin Caldwell, one of the most highly-rated American twentieth century writers, next to William Faulkner and Ernest Hemingway. 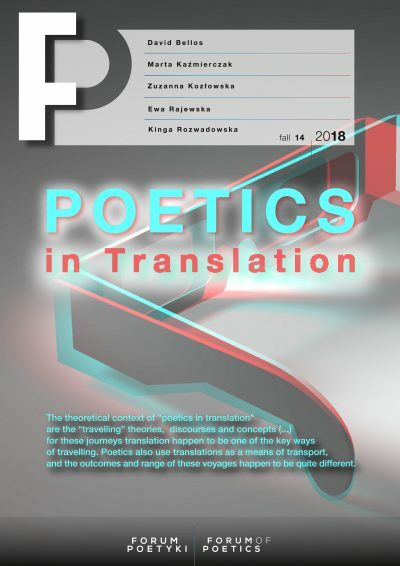 It seems that from the point of view of micropoetics that kind of subjective examination, involving concretization and simultaneous experience, identification with the narrating subject – possesses fundamental importance. From there only one step remains to be taken toward a thematic critique, interested not so much in archetypes, symbols, and motives as poetic images perceived by the reader, as Jan Błoński desired- “clearly, in rapture” or, in other words, in a state of merging with the psyche and world of the author (or sometimes of the narrator and author in one person), with the apprehended microcosm (step-by-step) as an instance of independent, separate, individual existence. We can thus accept that micrology (the study of that which is small, insignificant, minor) or micropoetics (a fundamentally deceptive term, one difficult to define precisely and whose theoretical connotations are hard to pin down, as readers can learn for themselves by reading the Aleksander Nawarecki’s essay on “black micrology”) grows out of the literary studies tradition that took shape after what is commonly called the “anti-Positivist breakthrough,” when it was acknowledged that literary theory demands the elaboration of its own scholarly tools, different from those used in the natural sciences. The encounter with a particular text, a close, penetrating gaze into it and analysis of it through the prism of micrology or micropoetics (or nanopoetics, to reference the terminology of the natural sciences) – all of that has been defined (with a somewhat jocular air of mystification, imitating an encyclopaedia entry) in the essay by A. Nawarecki cited above. Following in the tracks of the reflections of one continuator of thematic criticism, Nawarecki turns his attention to concrete motifs (images) and to how they are subjectively interpreted, determined not only by the personality of the reader, but also by the aesthetic of the text and the apparent personality of the writer. In the process there arises a certain aggregate or arsenal of scholarly tools and genre determinants of the work, all with equal claims to legitimacy. The former include a close perspective of interpretation (standing “face to face” with the text) and a lack of the need to invoke a broad context of meanings, or symbols, motifs and topoi that are also present in other works, or finally, conventions and aesthetics dominant in a particular period or epoch. The former constitute a somewhat larger group: the small size of the work, the intimacy of thought and reflection, the lack of a pre-defined system (for example, a sequence of images ordered by means of a logical or narrative-based “key”), the belief in the importance of the particular case or event, and in the significance of everyday activities that are seemingly unimportant, perceived in the “here and now,” sometimes without authorial commentary. If we accept, with Ewelina Suszek, that “Silesian literary micrology, interested in what is small, insignificant and ephemeral, inscribes itself within a certain general tendency”, then the diminutive dimensions of Erskine Caldwell’s novel Journeyman fit perfectly into that tendency or perhaps new current, increasingly and ever more vividly present in the context of contemporary criticism and literary theory. The fundamental condition here is always (as with the case of thematic criticism) the scholar’s identification with the text, an identification which is in fact difficult since it can only be achieved by means of rejecting or limiting the ballast of antecedent knowledge, whether pertaining to literary history or theory. The work of art in this context becomes a phenomenon that demands hermeneutic description, rigorous reading, interpretation conducted phase-by–phase, layer-by-layer, using “single-use” tools whose use outside of the context of the particular text analyzed most often turns out to be fruitless. In the latter half of the twentieth century, a kind of vogue prevailed in Poland for the literature of the American south, and in particular, the stories of Erskine Caldwell, which were adapted relatively frequently for the theatre and television. The Polish premiere of Jenny took place in July 1968 at the Teatr Dramatyczny in Warsaw, directed by Witold Skaruch; in March 1971 Teatr Telewizji showed God’s Little Acre, directed by Ireneusz Kanicki; and a few months later, in June 1971, selected episodes from Journeyman were dramatized in a production featuring a star-studded cast, directed by Gustaw Holoubek. Even then it was well-known that Caldwell’s prose (strongly expressive, compact, dense in content) “worked” beautifully on the stage. That, however, does not mean that such texts as Journeyman (1935), Tobacco Road (1932), God’s Little Acre (1933) and Trouble in July (1940) were not perceived merely as aggregates of well-written, “beefed-up” bits of reportage on life in the countryside, tied together by means of the main characters and the specific features of the places described. It is precisely those places the people inhabiting them, and the means of narration, that evoked the stylistics of overheard, remembered stories, and the dramatisation of the characters’ behaviour that made Caldwell’s prose an exceptional phenomenon within contemporary literature. In practice this means primarily that the person telling a story not only describes its world, taking on the point of view of a character (which often occurs in more conventional literary fiction), but also possesses a certain “insight” into the characters’ psyche, is present in situations in which a character talks to himself, engages in conjectures, wonders, considers, in which cases the use of the past tense is helpful, possessing as it does a somewhat different dimension in paradocumentary prose (of which storytelling can pass as an example) than in conventional literary fiction. Furthermore, events that seemingly belong to the past acquire (in the consciousness of the listener) the status of events taking place before his eyes, practically in the “here and now,” which also results from the use of techniques of prose dramatization. What we are talking about here is thus a “change in narrative perspective,” a phenomenon also referred to in analyses of texts inspired by reportage and “new journalism,” which perspective endows marginal, insignificant matters, or behaviours on the part of characters that we might well overlook in the context of a more traditional form of narration, with added weight. You learned by listening around the store, around the gin, the icehouse, the wood yard, or wherever people congregated and had nothing to do, Caldwell recalled. You would listen for the extraordinary, the unusual; the people knew how to tell stories orally in such a way that they could make the smallest incident, the most far-fetched idea, into something extraordinarily interesting. It could be just a rooster crowing at a certain time of night or morning. It’s a mysterious thing. Many Southern writers must have learned the art of storytelling from listening to oral tales. The prose texts that took shape in this way, usually small in size, shorter than a multi-layered novel, which were connected by the use of recognizable elements of writing craft typical of New Journalism, such as: scene-by-scene construction, the inclusion of entire dialogues lending not only plausibility but also dramatization to events, the use of a “third-person point of view,” and the consolidation of details documenting the characters’ life status. In the real world, in the situations referred to by Caldwell in the above quotation, storytelling ordinarily begins as a presentation of an event that arouses the curiosity of the audience, forcing the listener to sharpen his attention and concentration, just as might happen when listening to a well-constructed reportage. It is thus no accident that Journeyman begins with a scene in which Clay Horey, sitting as usual on the porch of his house, where he sits “week after week, year after year,” witnesses, through “the glare of the sun on white sand,” something completely unexpected as he squints his eyes: a “mud-spattered rattletrap of an automobile” coming to a stop out front. What becomes much more important here than the make of the car (if we look at the whole scene through the prism of the text’s specific dramaturgy) is the fact itself of its (the crumbling rattle-trap’s) extremely noisy entrance into the (hitherto peaceful and quiet) living space of Clay Horey, a naïve, good soul who looks at the surrounding world from the perspective of his porch or veranda, sometimes through a hole in the boards of the mended barn that belongs to his equally goodhearted neighbour, Tom, a corn producer. It seems that precisely that perspective, involving observation of the external world in relation to a character’s experiences (an inhabitant of the isolated, hermetic South) from a particular point, always from the same place – gives the dimension of reportorial verisimilitude to the characters who appear in the text. Caldwell often underscored that he only wrote about people he actually knew, whom he observed “as they really lived, moved, talked” and whose way of seeing reality became his own. His prescription for literary success seems utterly natural and simple from today’s perspective, in a cultural context which long since assimilated the concept of the New Journalism: don’t wait for inspiration, take notes on everyday occurrences as a daily correspondent does, don’t take any interest in what others are publishing, write short, pithy texts, listening acutely to the speech rhythms of those whose stories turn into the canvas of your narrative. At the moment of this unusual self-presentation Semon does not even attempt to maintain an appearance of social propriety: he begins appraising Clay’s property with a professional eye, asking the kind of unceremonious questions that a bailiff in court asks before an auction begins. When consistently followed, the procedure of using a close-up narratorial perspective, involving the dramatization of events and attribution of particular importance to them, is additionally underlined with grotesque and irony, as well as expressiveness, clarity and intensity in the characters’ behaviour, where each of them sticks to his assigned role: on the one hand, the naïve “good soul,” the poor farmer leading a hitherto quiet life (Clay Horey); on the other, the ruthless, cynical scoundrel who arrives unannounced in front of your house (Semon Dye). Everything here is stamped with dramatic intensity: Clay’s short, crisp utterances as he talks to himself in an “aside” like an actor in an amateur theatre, the distinct profile of Semon Dye, who solemnly demands that others recognize him as “a man of God” and who, in his decisive, brusque, rather painful gestures (as when he does not hesitate to jab poor Clay between the ribs with his bony finger or crush his hand in a numbing, seemingly endless handshake) imposes admiration and respect for his person, dirty and highly suspicious though he may be, covered with dust and dressed in a worn-out capote. Thus, we see in action both the age-old model of tragedy in action as developed within hermeneutics and grasped in the categories of the “aesthetics of the tragic,” and the model (familiar from the dramas of classical antiquity) of the struggle between good and evil inscribed in the fate of the human being, “eased” slightly by the workings of Fate, whose personification and messenger, its unsettling and intriguing embodiment, is none other than Semon Dye. In the context of the micronovel, this “tragic conflict” becomes endowed, in addition, with a characteristic aspect of irony, dark humour, and grotesque, which Caldwell achieves through the collision of the solemn and sublime with the trivial, the pathos and rhetoric of “church” discourse (skilfully deployed by Dye) with the bluntness of the colloquial speech style of farmers, sometimes called “white trash” (a term containing obvious racism against blacks) and the language of the Afro-Americans who work on Clay’s property. That thought is later revealed to be the key to understanding the text, and is yet more on point in that over the course of the narrative, such an opinion, expressed by Clay with anger, with a sense of his own helpessness and powerlessness, grows to reach practically the level of a universal maxim. It is noteworthy that, “the man” drives up (where from, nobody knows, with the inevitability of Fate, like the verdict of a cruel and implacable destiny) and captures everything for himself: the heart of shy young Dene, Clay’s last wife, who the preacher has no trouble “emboldening,” the well-kept car that he wins in a game of dice together with the whole farm, a keepsake watch and a small amount of credit taken in anticipation of the next year’s harvest. “The man” drives up and casually seduces the mulatta servant “Sweet,” who is beautiful and aware of her beauty, at the same time, quarrelling with her fiancé, Hardy, at whom he fires a gun, calmly, almost reluctantly, not shooting to kill, only to scare him a little. So in fact the appearance of the preacher, because of the scene quoted above, which fulfils the function of a dramaturgical counterpoint in the linear narrative, has (if looked at from the perspective of the text as a whole) a dimension not only of “scandalous” paradox and grotesque but also of a symbol deeply rooted in the collective unconscious. The unusual nature of this uninvited guest, this servant through whose lips God himself speaks, is manifested in small, seemingly insignificant gestures and words that are carried out (as he is given to say) to “praise God!” It is he, Semon Dye, the personification of both good and evil, the envoy of God and the Devil who silently throws the dice in a fluid, dance-like movement when the stakes are maximally high for Clay, concerning the loyalty and recovery of Dene, the fourth and, it appears, most beloved wife of that unhappy, hopeless and disillusioned farmer. It is he, too, this unexpected visitor, wrecking the lethargic peace and quiet of the provincial one-horse town, who befriends Tom, Clay’s soft-spoken, introverted neighbour, desiring to turn him (in a most perfidious way) into someone much more important than just a witness or vigilant observer of scenes choreographed by Dye. Tom, due to his nature (a fondness for stubborn silence, simplicity, cowardice and a certain kind of conformism), sanctions all of Semon’s offenses by the very fact of his presence at the most important moments in the text, rendering their immediate acceptance possible. There is no theatre without spectators or “public opinion,” and Semon Dye appears to be fully conscious of that fact, as he flawlessly manipulates the fates of his potential and actual victims. Haughty, bossy and insolent, greedy and brusque, he seems to conceal within him some sort of “mystery,” something that ties his person to the world’s ageless order, that makes him an artist and a prestidigitator, a rogue and vagrant, a rascal and personal servant to a rather distant and obscure, typically silent God, indifferent to people’s struggles and situations. After the departure of this preacher, the first summer downpour washes away the fresh marks of his tires on the sandy road leading somewhere far away. Perhaps it is a sign of purification. Yet the text provides no proof of that, and such an interpretation may be a bit of a stretch. Clay once again takes up his old, beloved place on the porch, now in the company of his third wife, the prostitute Lorene, for the possibility of meeting with whom Dye has previously made him pay dearly… “They both sat silent for a while, each looking down the road towards McGuffin. Clay felt weak over the loss of his car, but he would not have felt so badly if Semon had not gone away as he had. He had hoped to have the satisfaction of seeing Semon drive out of the yard and out of sight down the road. He felt cheated now.” But these are not the final, parting words with which Caldwell chooses to close the novel, which does not end at the moment of the preacher’s departure, as would a well-written reportage or a collection of short, sharply expressive, intensely meaningful paradocumentary texts that follow the conventions of New Journalism (whose literary trademark came to be the crossing of genre boundaries or, as twentieth-century adherents put it, “a mixture of inventions, fiction, and document”) cannot end with some kind of concrete conclusion. As Erskine Caldwell would have it, postulating that the writer follows a certain road determined by the fates, whether really existing or merely capable of existing, of characters who are always true to life: “a conclusion is just around the corner.” How can the author so sure, however, that this road does not (like most roads in the South, leading through sun-scorched waste lands) in fact lead from nowhere to nowhere? The answer to this question, fundamental to an analysis of Caldwell’s prose style and to grasping the individual traits of his writing, is provided by a close look at the text and an attempt to describe it using the tools of micropoetics. When performing a fairly superficial analysis (a more penetrating one could easily provide the basis for a longer scholarly work) of a few selected scenes from Erskine Caldwell’s story, it is important to answer the fundamental question: Why micropoetics? After all, it would be possible to study Journeyman using tools typical of structural analysis, concentrating on such elements as the position of the narrator, the trajectory of the linear plot, or the psychological construction of the characters. We could also venture to describe and explain the text in terms of hermeneutics. In both of the cases mentioned, however, in either of those interpretative approaches, the reading would take place at a clear loss for the work studied, which (when subjected to traditional vivisection) would be submitted to oversimplifications, all the more so since conventional methods of analysis demand the advancement of a thesis, which would place further limits on the field of interpretation. In examining Caldwell’s prose, whether we look at Tobacco Road, God’s Little Acre, Tragic Ground, or A House in the Uplands, a literary scholar cannot escape the conviction that all of these texts are connected by a specific formation of space in lieu of action (the southern states of the USA), a way of proceeding that evokes the reportage narrative, and above all, methods that involve getting to know the characters’ world, step-by-step, by accompanying them in their daily, seemingly dull, monotonous and ordinary lives. These features only reveal themselves most fully when we bring to bear on our analysis the tools of micropoetics, with the stipulation, however, that the direct experience of the text, the fact of being somehow inside the represented world, relates above all to Caldwell’s skilful application of the knowledge and practice of reporting and journalism. The key formulation here is the question of seeing – not only knowing from hearsay; this could be further elaborated on by clarifying that the point is not just seeing, but seeing through the “window,” experiencing important things, with the concept of importance defined in the context of a particular time and particular social relations. In the case of Caldwell’s prose, what is “important” plays out in small, provincial communities, because that is where stories are told, and that is where people listen to them attentively, experiencing (as we experience in looking through a window) the life of other people, often strangers. The task of the writer or storyteller is to open just such a window. 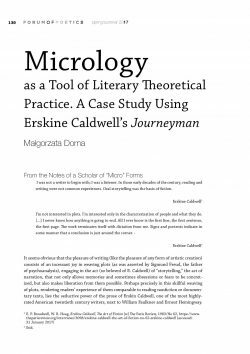 The aim of this essay is to show a way of using the tools of micropoetics to analyse a specific text, Erskine Caldwell’s novel Journeyman, which represents a specific genre of literary utterance, and also the influence of the New Journalism on Caldwell’s technique. Important here is the small size of the work analyzed, the belief in the role of chance, everyday occurrence, colloquial style, the lack of literary references or borrowings, and the specific method of presenting the characters. A characteristic feature of Erskine Caldwell’s prose is also the dramatization of certain scenes and an effort to “theatricalize” the characters. This is a reference to the title of an essay in book form by Jan Błoński, Widzieć jasno w zachwyceniu (Seeing Lucidly in Enchantment), PIW, Warszawa 1965, in which this beautiful phrase means something more than perceiving the text through intense emotion in moments of illumination or revelation. A. Nawarecki here mentions Przemysław Czapliński, author of the book Mikrologia ze śmiercią. Motywy tanatyczne we współczesnej literaturze polski (Micrologues with Death. Thanatological Motifs in Contemporary Polish Literature) as a precursor in the attempt to look at a short text from a close perspective. Translated into Polish in 1959 by Krzysztof Zarecki as Sługa boży (literally the Servant of God). E. Caldwell, Journeyman, New York 2011, e-book edition. T. Capote, In Cold Blood, New York 1965. J. Steinbeck, The Grapes of Wrath, New York 1996. E. Caldwell, Journeyman, op. cit. T. Wolfe, “The Birth of ‘The New Journalism’”; New York, 14 February 1972. , http://nymag.com/news/media/47353/index9.html (accessed 27 May 2017). E. Caldwell, Journeman, op. cit. T. Wolfe, “The Birth of ‘The New Journalism,’” op. cit. A. Lelchuk, R. White, “An Interview with Erskine Caldwell,” in Conversations with Erskine Caldwell, ed. E. T. Arnold, Jackson 1988, pp. 83–84. E. P. Broadwell, W. R. Hoag, Erskine Caldwell, The Art of Fiction, op. cit. T. B. Connery, “The Third Way to Tell the Story,” in Literary Journalism in the Twentieth Century, ed. N. Sims, Evanston 2008, p. 13.